France’s Mathis Bondaz became Accra ITF 8 J5 Junior World Junior Circuit with a superb performance against second seed Eshaan Lumba from India in the final. Bondaz, 17, dismantled the Lumba serve in a 6-3, 6-2 victory to repeat his triumph in the Accra ITF 8 J7 World Junior Circuit title he claimed last week against Damien Laporte. Bondaz was having none of it, taking advantage of a slightly fortuitous early break to surge ahead with some magnificent defence and a rasping backhand winner to win the first set 6-3. In the second set, Bondaz’s brilliant backhand winner set him on the way to another 5-2 lead and with the crowd chanting “Bondaz! Bondaz!”, he pummelled a forehand into the corner on his second match point that Lumba could only return into the net. Belgium’s Juliette Bovy made her name as she ousted France’s Astrid Cirotte 6-2,6-4 in an hour 15minutes. Benin’s Vence N’tcha and his partner from Great Britain Ronan Sahni won the boys doubles. 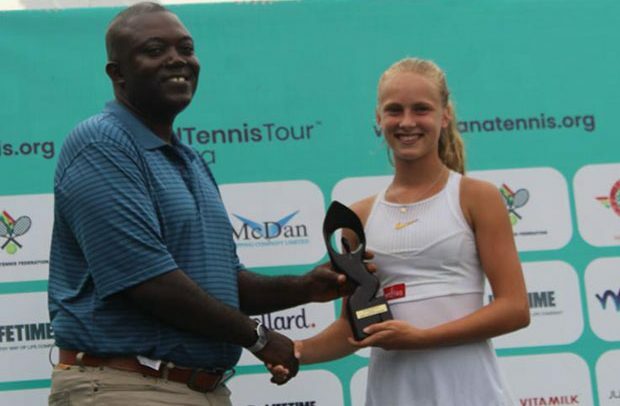 In the girls’ doubles, Switzerland’s Chelsea Fontenel and Belgium’s Chyara won the girls’ doubles title. The two-week tourney was sponsored by McDan Shipping Company, Hollard Insurance, Coconut Groove Hotel, Life Time USA, Ann Natural Mineral Water, Vital Milk, Rosswoodghana Co. Limited, Sports Drive Volunteers and Baboo Sports.